Need a quick activity for the kids to do? 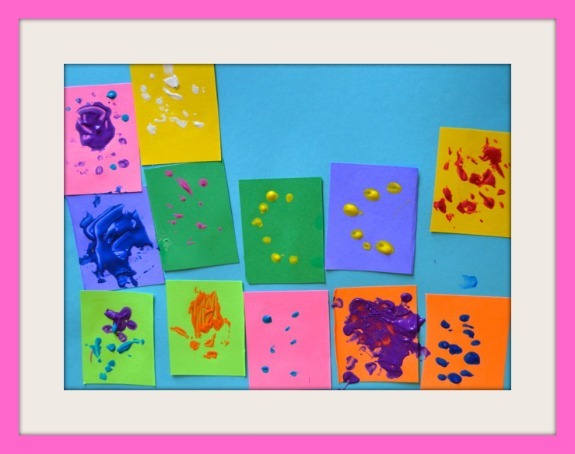 Here’s a project that’s easy to set up for the kids and encourages them to explore the art technique of pointillism! Pointillism is the use of small dots to form an image when seen from a distance. You may want to sit down and paint along with the kids for this. Can’t let them have all the fun, right? For our invitation to explore activity, we started with a simple collage using squares of colored paper. 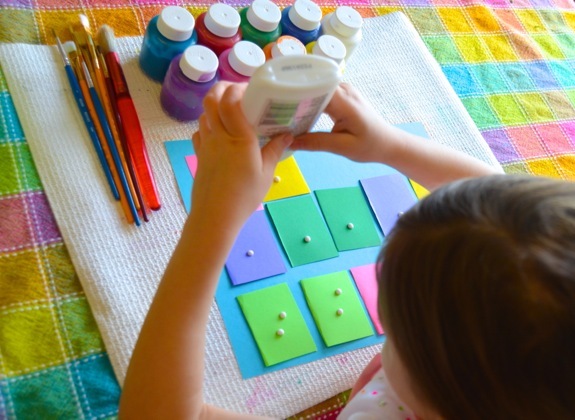 I invited Clara to arrange the squares however she liked, and she glued them to the paper. Lately, she has noticed that “less is more” when it comes to glue. (Thank goodness!) 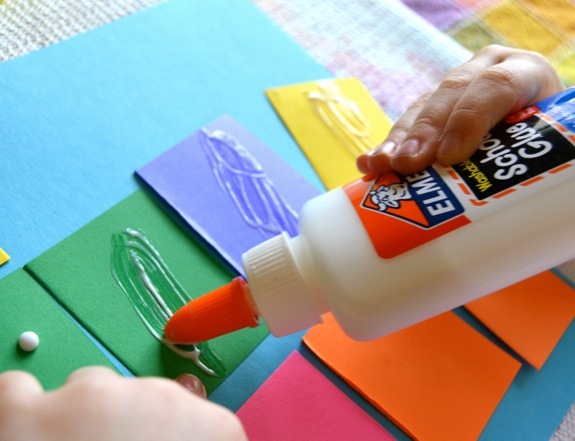 So she uses small dots of glue, then spreads them around using the tip of the glue bottle. Next, it was time to paint! To encourage the use of small dots of paint, I set up the bottles of washable paint with an upside-down paintbrush in each one (a cotton swab would work well for this too). Clara loved choosing which colors to paint, and for some reason using the opposite end of the paintbrush really appealed to her! She happily painted like this for a very long time! 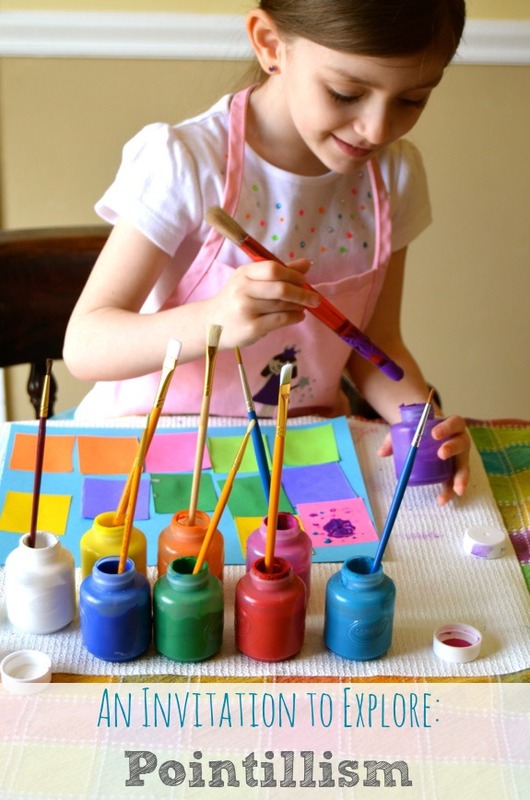 Clara went on to make an entire series of paintings using this technique! I love the textured look to her paintings, and how bright and cheerful they look. Each one is completely unique! 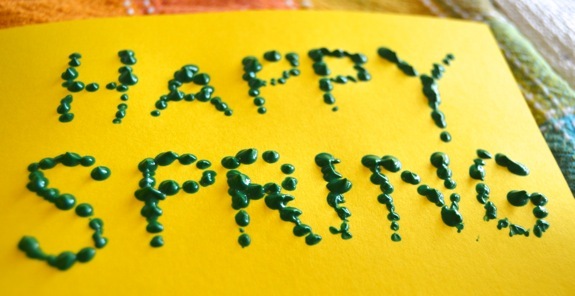 “Happy Spring”, says the snow!